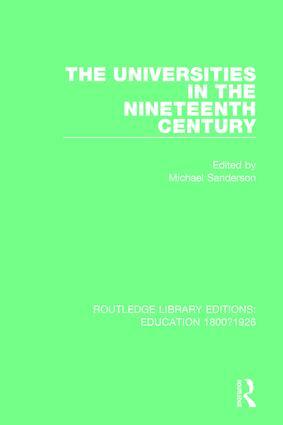 This title, first published in 1975, analyses the ways in which developments in Victorian universities have shaped both the structure and the assumptions of British higher education in the twentieth century. No period of British higher education has been more full of change nor so rooted in fundamental debate than the second half of the nineteenth century. Its lasting impact makes it crucial for an understanding both of this period of Victorian social history and of the contemporary system of higher education in Britain. This title will be of interest to students of history and education. This set of 14 volumes, originally published between 1932 and 1995, amalgamates several topics on the history of education between the years 1800 and 1926, including women and education, education and the working-class, and the history of universities in the United Kingdom. This set also includes titles that focus on key figures in education, such as Samuel Wilderspin, Georg Kerschensteiner and Edward Thring. This collection of books from some of the leading scholars in the field provides a comprehensive overview of the subject and will be of particular interest to students of history, education and those undertaking teaching qualifications.